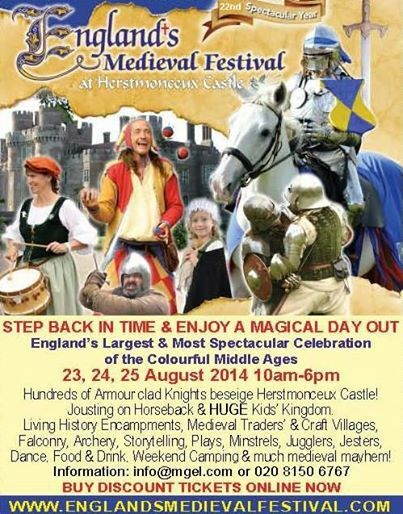 Step back in time and watch history come to life at The largest and most Authentic Medieval Festival in the UK - hosted at the Herstmonceux Castle. This moated castle stands majestically in the Sussex countryside. In 1993 thanks to the generosity of Drs Alfred and Isabel Bader, the Castle was acquired by Queen's University of Canada.The castle was then converted into an International Study Centre attracting students from around the world. The festival provides insight into life in a medieval village by re-enacting everything from peaceful daily routines to full blown sieges with entire armies of archers including horses and cannons.This event is in its 22nd year and promises to be bigger and better than previous years with over 2,000 costumed performers and participants expected from all over Europe and as far as Canada and the United States. a twice daily siege of the castle and battles -with hundreds of knights, archers and men-at-arms plus cannons and trebuchet; armoured knights jousting and skill-at-arms tournaments on horseback. Longbow and crossbow archery competitions. Spectacular grand parades - puppeteers, jesters and strolling minstrels. Europe's largest Medieval traders' market - with fabulous craft stalls. Living history encampments - with demonstrations. Live entertainment - music, dance, theatre and storytelling. Kids' Kingdom- with games and shows. Authentic food, hog roasts; and much more. There are three outdoor and two indoor stage areas, with performances throughout the day. In the evening all performances are indoors in the main marquee. Peasants Pottage, Zeitenwanderer, Perdix, United & Queen's Players. Watch the video below on how the festival came about, and a description of all the elements that make this festival so special. Come and enjoy a full day out for the entire family. England's Medieval Festival supports (JDRF) Juvenile Diabetes Research Foundation. Learn more about the organisation here. This is great - I definitely want to go!